Update ! Download More PDF Book. Click Here ! • Alfred Nobel on 27 November 1895 signed his will for Nobel Prizes in Physics, Chemistry, Physiology or Medicine, Literature and Peace. • In 1968, Sveriges Riksbank established The Sveriges Riksbank Prize in Economic Science to Award Nobel Prize in Economics. • Nobel Peace Prize is awarded in Oslo, Norway. Other prizes are awarded in Stockholm, Sweden. • First Organization to Received Nobel Prize is Institute of International Law in 1904. • Office of the United Nations High Commissioner for Refugees, has received the Nobel Peace Prize twice, in 1954 and 1981. • Till now Nobel Prize awarded 44 times to women. • Marie Curie is the first woman to received Nobel Prize in 1903. • Only one woman, Marie Curie, has been honoured twice, with the 1903 Nobel Prize in Physics and the 1911 Nobel Prize in Chemistry. • The youngest Nobel Laureates is Lawrence Bragg at the age of 25 in Physics, 1915. • The oldest Nobel Laureates is Leonid Hurwicz at the age of 90 Economic Sciences, 2007. • Four people have received two Nobel Prizes: Marie Curie , Linus Pauling, John Bardeen, Frederick Sanger. • Marie Curie is the only person to win a Nobel Prize in two different sciences. • With total five, Curie family has received the most prizes: (Marie Curie received 2, Pierre Curie received 1, Irène Joliot-Curie and Frédéric Joliot-Curie received 1,Henry Labouisse received 1). • Till now two People decline Nobel Prize. First person to declined the Nobel Prize is Jean-Paul Sartre, in 1964 in Literature. • First Nobel Laureates to be awarded under arrest is Carl von Ossietzky, Germany. 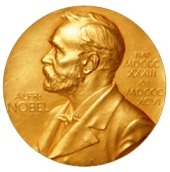 • Nobel Prize has only been awarded posthumously twice: Dag Hammarskjöld 1961 and Erik Axel Karlfeldt 1931.